The 2016 Mid-Continent Digital Oilfield Conference is coming up in about a month in Tulsa and will feature new technology platforms in the industry. Sponsored by Sustaining Oklahoma’s Energy Resources, the conference will feature a keynote address on “Energy and the Mid-Continent Economy” to be delivered by Dr. Russell Evans, director of Oklahoma City University’s Steven C. Agee Economic Research and Policy Institute. The conference will be Feb. 17 and 18 at the Hyatt Regency Hotel in Tulsa and will include workshops on Spill Prevention, Control and Countermeasures and Federal Air Regulations. 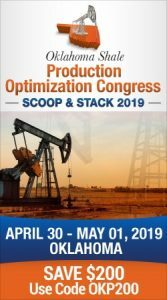 But other big presentations will include sessions by an Oil and Gas Regulatory Exchange Panel, Induced Seismicity to be presented by the Oklahoma Corporation Commission, FracFocus 3.0 presented by the Interstate Oil and Gas Commission and the Ground Water Protection Council, and Drone Track which will showcase how drones are impacting oil and natural gas exploration and production.